The Trump administration took little effort to plan on an interagency basis for its policy to separate families at the border and ignored warnings about the consequences of that approach, officials told lawmakers on Thursday. White said he first sounded the alarm on family separations when it was pitched as a policy proposal in February 2017. He told his superiors its implementation would lead to more detained children than ORR had capacity to hold and, more generally, that it would cause harm for the children. “I do not believe the separation of children from their parents is in the best interest of the child,” White said. On this, White was greeted with bipartisan agreement. “I strongly believe children should not be separated from their parents, period,” said Rep. Greg Walden, R-Ore., the full committee’s ranking member. White explained that he was not alone in voicing his concerns—which he said he publicized through memoranda, emails and in meetings—about the separations before they became official policy. “The concerns that I had about separation were shared by every career member of my team,” White said, adding that he was “confident” they continued to bring those issues up the chain even after he temporarily left ORR for another assignment. When White and his team brought reservations to their supervisors, they responded that there was no official policy in place to separate border-crossing children from their parents. Then-DHS Secretary John Kelly in 2017 publicly declared there to be no such policy, which White’s superiors subsequently referenced. ORR continued, however, to see the number of separated children in its custody spike. The Government Accountability Office confirmed that account in its own testimony, saying the number of separated children in ORR’s custody increased tenfold between November 2016 and August 2017 and the concerns of HHS career officials were repeatedly dismissed. Once the policy became official, HHS was given no warning and scrambled to implement it. Prior to Sessions’ announcement, Larin said, ORR officials discussed planning for the ongoing influx of separated children, but they were “advised by HHS leadership not to engage in such planning given that DHS did not have a policy of separating families.” Ann Maxwell, the HHS assistant inspector general, said ORR was ill-prepared for the spike in separated children coming into its custody because it was previously “quite rare” for that to happen. The agencies involved “did not plan for this policy and it showed,” Pallone said, adding they were forced to make up policies on the spot. 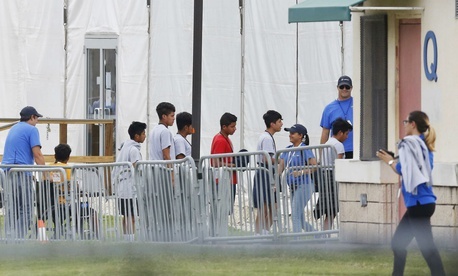 After President Trump issued an executive order halting the separation policy and a federal court issued an injunction ordering a speedy reunification process, the administration again struggled to share information and issue a coherent policy. HHS entered into an “extensive, labor-intensive” effort to identify all the separated children in its custody, Maxwell said, including sorting through 60 different data sets. Larin added there was “no reliable database” tracking separated families when Sessions announced the zero-tolerance policy. The HHS IG unveiled earlier this year that the administration separated thousands more children than it initially estimated. GAO noted DHS is still separating families when a parent is deemed unfit to care for a child or the parent has a criminal history. The auditors will release figures on those separations in an upcoming report later this year. White noted that the repercussions of the administration’s policies are also still ongoing. “The consequences of separation for many children will be lifelong,” White said.